Employees and volunteers from the City of Edmundston welcomed the Edmundston University and College community as part of the traditional Edmundston Open House event on Thursday, Sept. 6, in the cafeteria Édupôle. EDMUNDSTON, New Brunswick — Employees and volunteers from the City of Edmundston welcomed the Edmundston University and College community as part of the traditional Edmundston Open House event on Thursday, Sept. 6, in the cafeteria Édupôle. Guests enjoyed a typical meal from the region, chicken stew and ployes. Attendance prizes were drawn and awarded to college and university students from both educational institutions. 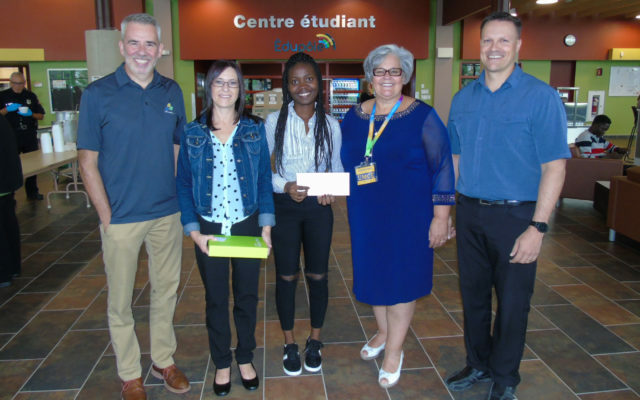 Mélanie Mercure of Saint-Jacques, a student in the office management program, won an iPad, courtesy of the City of Edmundston. Gift certificates of $100 to the bookseller Édupôle went to Cécile Ndioukan of Senegal, a student in the biological laboratory technique program, and Jolaine Lang of Clair, a student in the preparatory program in health sciences.